The past quarter has been marked by a continued rise in oil prices and capital outflows from emerging markets, fuelling the depreciation of their currencies. 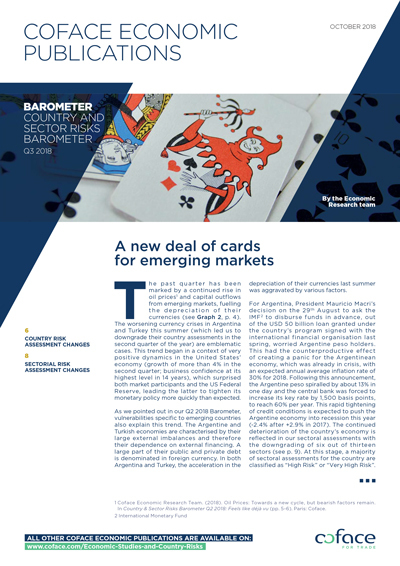 The worsening currency crises in Argentina and Turkey this summer (which led us to downgrade their country assessments in the second quarter of the year) are emblematic cases. This trend began in a context of very positive dynamics in the United States’ economy (growth of more than 4% in the second quarter; business confidence at its highest level in 14 years), which surprised both market participants and the US Federal Reserve, leading the latter to tighten its monetary policy more quickly than expected.